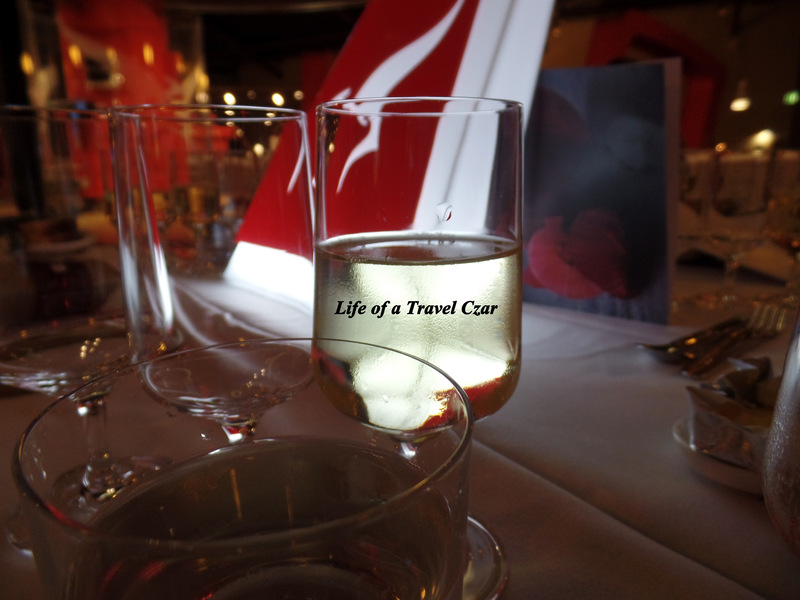 So have you ever wondered what’s behind the culinary delights you’re having at 30,000 ft? 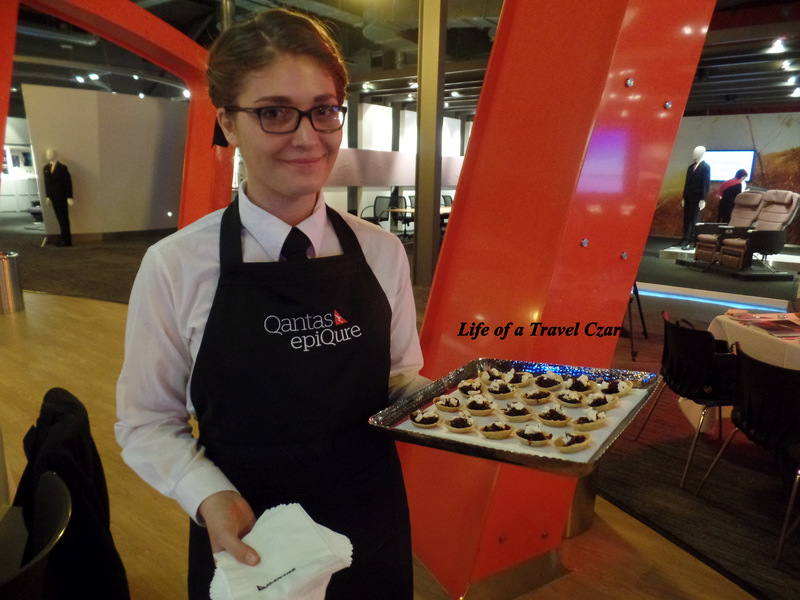 I have always been curious about the quality produce behind the dishes onboard and I was privileged to attend an event hosted by Qantas EpiQure called “Producer to Plane” this week at the Qantas Service Centre for Excellence. 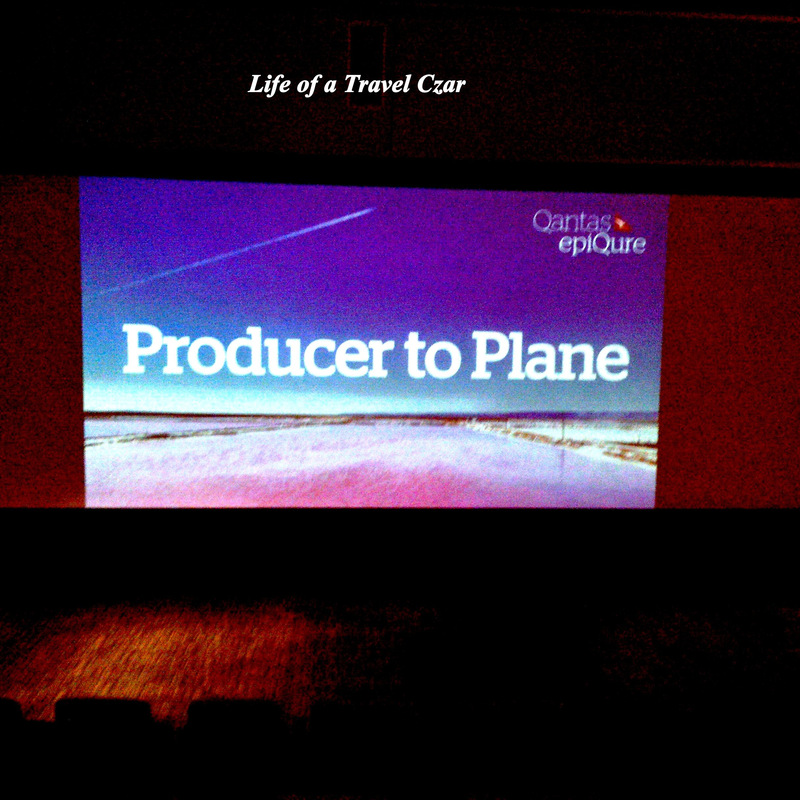 It was a fantastic behind the scenes look at the amazing produce that you find on your plate when you traversing through the air on a Qantas plane. We started with some Oakridge, Blanc de Blancs, Yarra Valley (2010) on arrival and were seated in a cosy auditorium where a Rockpool consultant and Qantas staff provided us with overview on the sort of produce they source for Qantas and an outline of how the night would unfold. We then eventually made our way into the main dining area. 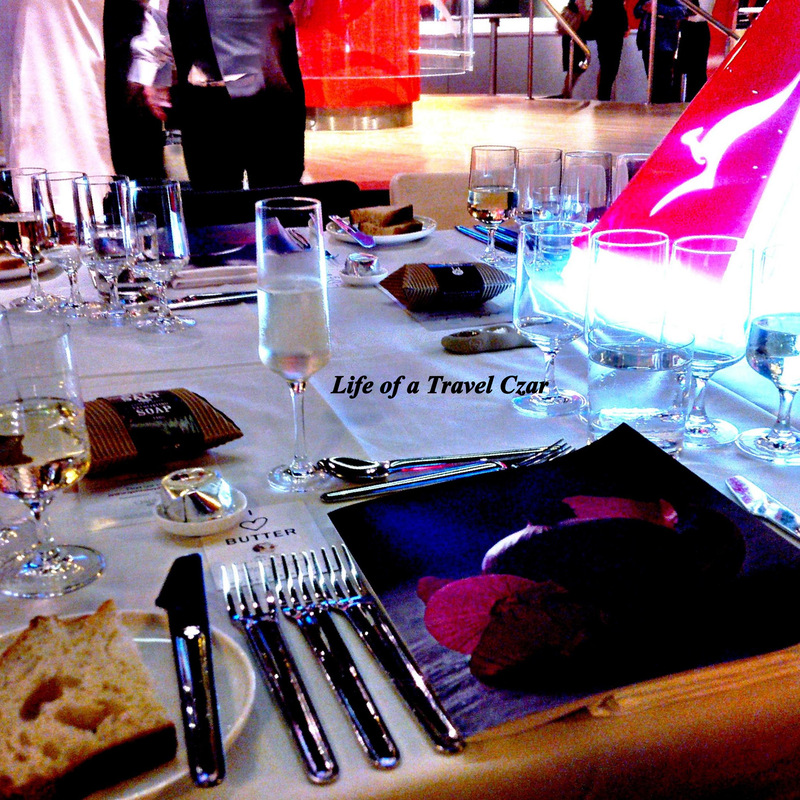 At the dining event, the table settings were simply amazing; in fact I was just completely amazed by the venue and décor which was almost like being back on a plane. 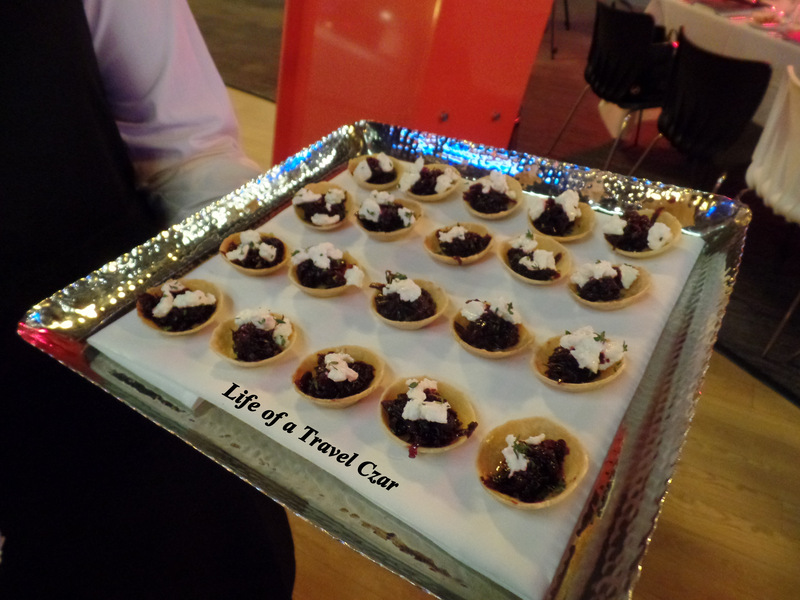 The sweet juiciness of the beetroot was pitted against the tart creaminess of the goat’s curd and the crumbly buttery softness of the tartlet, while the fresh herby kick of the thyme rounded out the first canape. 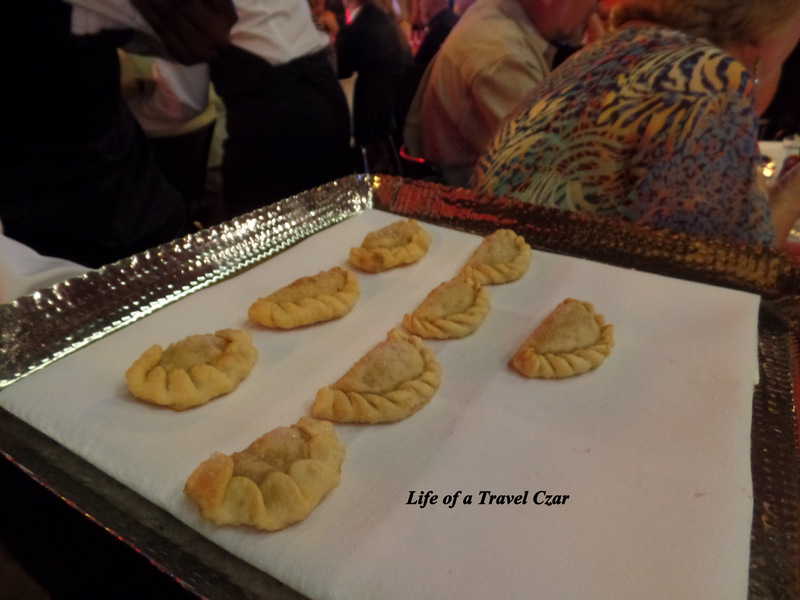 The rich red juicy capsicums were stunning with the rich Mediterranean flavours dominating the canape which was encased in a beautifully textured pastry casing. David Bicknell from Oakridge Wines talked through how this vintage chardonnay went on a journey for five years to deliver the sparkling wine we have before us today. David is particularly passionate about making quality Yarra Valley wines and discussed his excitement over harvest time. In relation to the sparkling wine, David noted he was particularly fond of the pastry and brioche style characteristics which he explained to all the guests. I also noted a light touch of toasted almonds and gentle citrus notes with candied creamy texture on the palate which was rounded out with a refreshingly cleansing acidity. 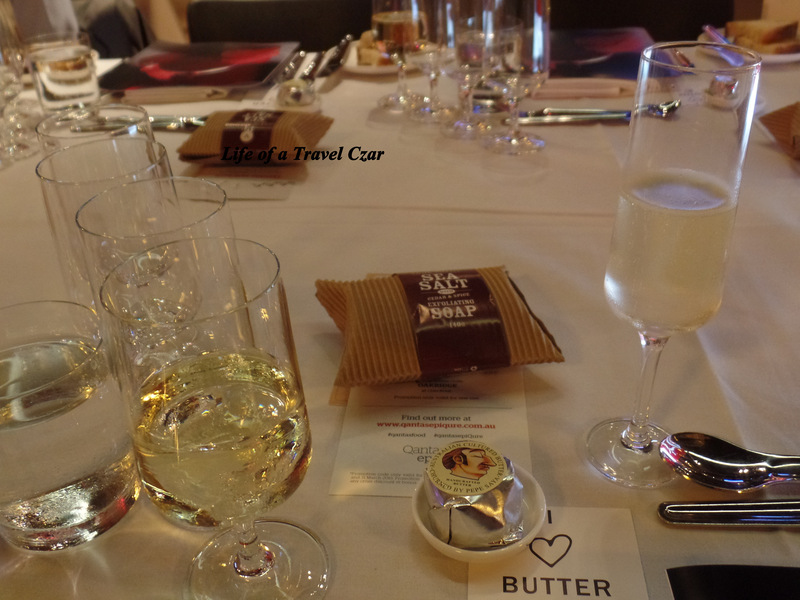 Prior to the entree we were treated to some lovely sourdough bread with Pepe Saya Butter which was decadently creamy and rich. 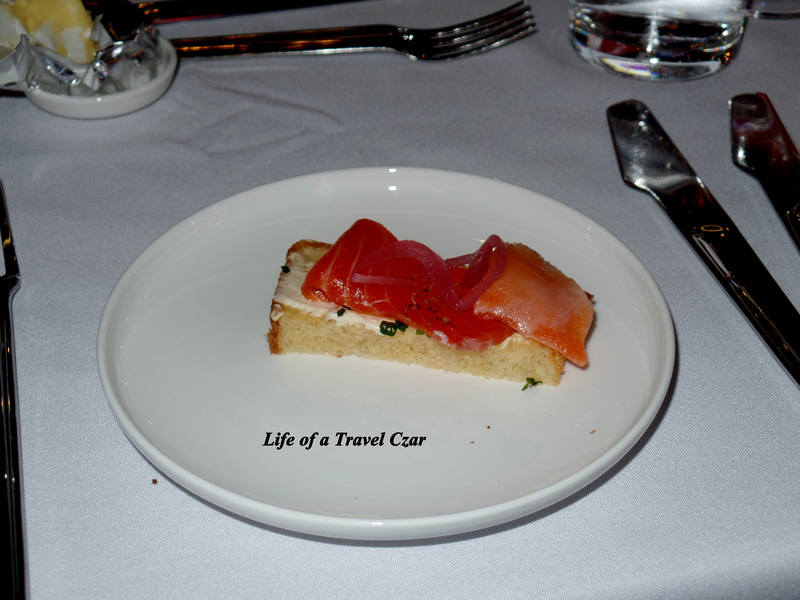 The first dish was the Olsson’s Salt Cured Ocean Trout with Pickled Red Onions, Coriander Seeds and Toasted Brioche. Qantas uses Olsson’s sea salt in their First Class Cabins. Olsson is the only family-owned and operated company producing salt in Australia. The beautiful waters of the Great Australian Bight and natural elements which define the Eyre Peninsula show their presence in the salt which has a clean taste and is rich in natural minerals. The salt has a wonderful crisp fresh flavour and is perfect for the cured trout adding some nice fresh flavoured minerality without detracting from the natural flavours of the trout with its rich oily texture. The pickled onions and coriander seeds add a light tang while the fluffy toasted brioche and butter provided the perfect base for the dish. This is made slightly differently to the other Chardonnay. The wine has lovely notes of floral blossoms, citrus and stone fruit notes. One the palate the strength of the minerality and flint texture was notable underpinning the bright citrus flavours and lovely acidity. 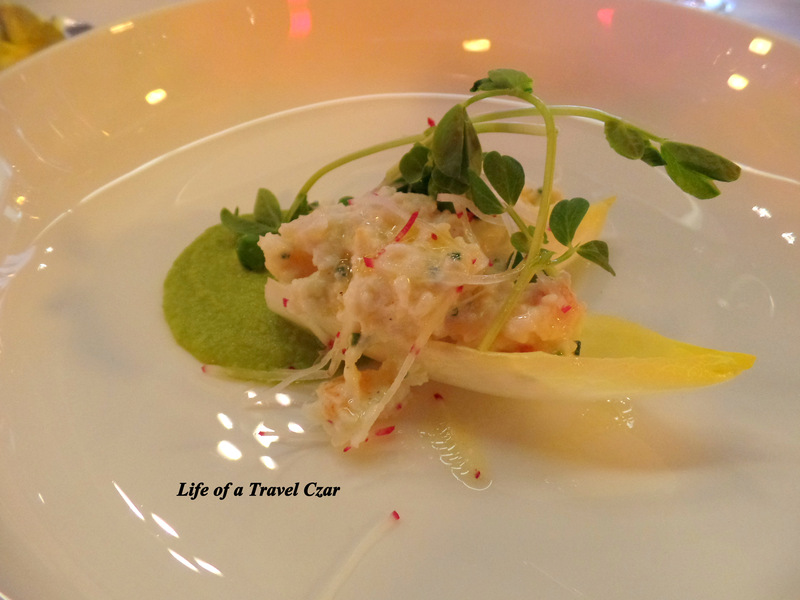 The second Entree was the Fraser Island spanner crab with crème fraiche, chives, radishes, and peas. 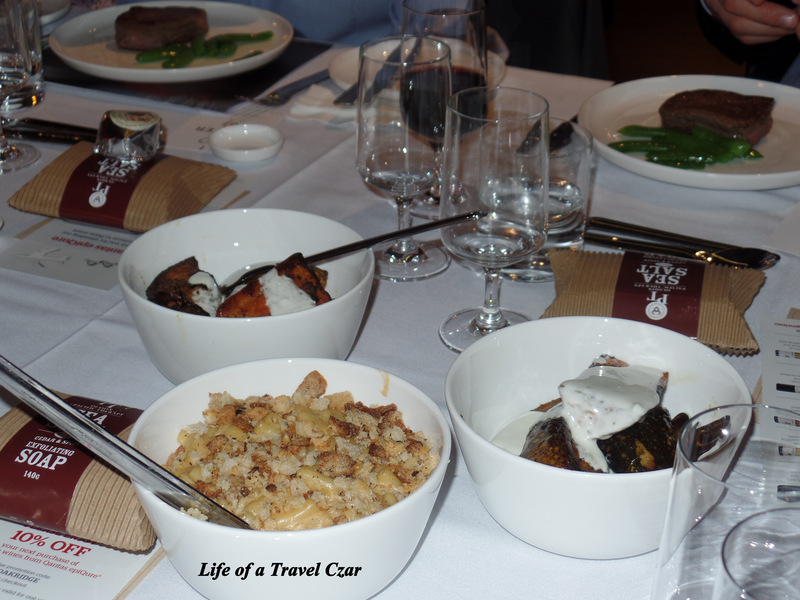 The spanner crab has to be one of the most amazing dishes I have tasted from Qantas. It’s all about the produce, apparently the Queensland Spanner Crab swims forward (it doesn’t crawl sideways like most crabs) and they live in very pristine waters and actually have a pretty good diet of scallops and prawns which provides the perfect explanation to their succulent and fresh tasting meat. Les Apps (from Fraser Island spanner crab) informs us of the difficulties in catching these beautiful crustaceans and how some fisherman lose their lives in the pursuit of the Spanner Crab – it is a very sobering thought and makes you all the more appreciative of the lengths taken to bring this quality product to your plate. The succulent crab is a fresh, clean with a light smoky residual flavour and partners perfectly well with the intermingled crème fraiche. The chives provide a lovely herby note and colour while the radish provides some light bite to balance a very clean flavoured dish. The crab is placed in some lettuce cups which offer some crunch while the peas and pea puree provide a lovely mild taste which doesn’t overpower the crab. This dish is all about the spanner crab and nothing else attracts any attention away from it. The dish is paired with the Oakridge, Local Vineyard Series Chardonnay, Lusatia Park Vineyard (2012). This Chardonnay is from grapes which sourced from the north facing Lusatia Park vineyard situation upon the red volcanic soils of Woori Yallock. Again this Chardonnay provides a lovely waft of floral notes on the nose with the bright citrus flavours and long acidity being the perfect pair for a seafood dish. Note the picture above is of the first Chardonnay (I forgot to take a picture second one, but it looked very similar). Cape Grim is on the north-western tip of Tasmania which has the world’s most pure air and rain, making for perfect grazing land all year round and it rains for around half the year to ensure the pastures are continually looked after. The superior quality of pasture is indeed reflected in the quality of the product while the ageing of the beef is critical which produces more marbling and flavour. 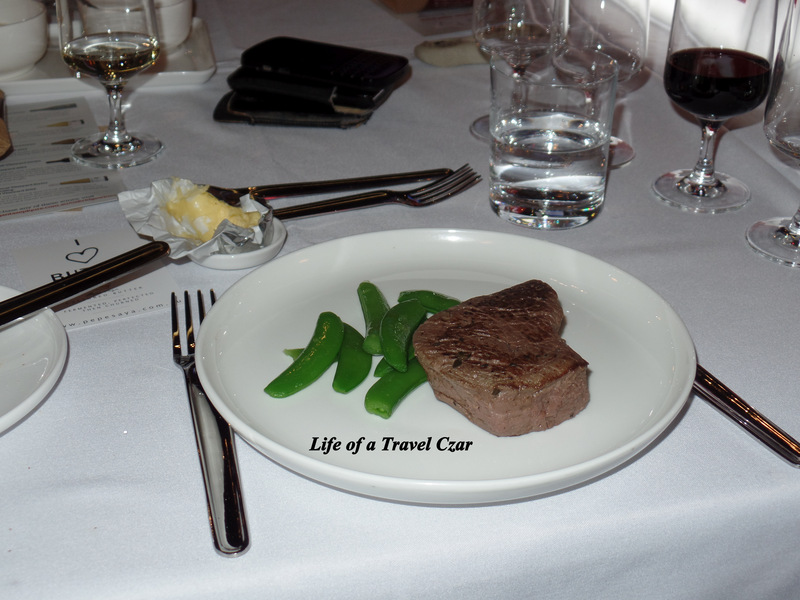 I actually had this dish onboard Qantas A380 back from London (you can check out my review here). The beef is succulent, with rich and full flavour. The texture is perfect and every mouthful just releases the full flavour of the beef with a soft texture of the middle of the beef and a smoky flavour on the outer part of the beef which has experienced the heat of the grill. The sugar snap peas add a lovely crunch while the horseradish condiment adds a lovely bite to round out the experience. The Mac ‘n’ Cheese is the very definition of comfort food with the soft pasta and the creamy cheese with the crusty / crumbly topping receiving the tick of approval from every sense in your body… but maybe not the tick of approval from your doctor. The pumpkin and sweet potato are lovely with tart creaminess of the yoghurt and the smokiness of the butter providing the perfect topping. The cabernet has wonderful aromas of cassis and blackcurrants and wonderful silky floral notes. On the palate the strength of the redcurrant flavours with hints of velvety chocolate provide for a wine which is elegant and has a wonderful structure. It is a lovely partner to the beef and probably my favourite wine of the night. As we move onto dessert the focus is on Butter! Pepe Saya Butter is certainly high quality and I have always fallen in love with their rich pure creamy flavour. The cream content (single origin sourced from cows in Picton, NSW) of their products is high and they actually use mincers not churns to make the product. 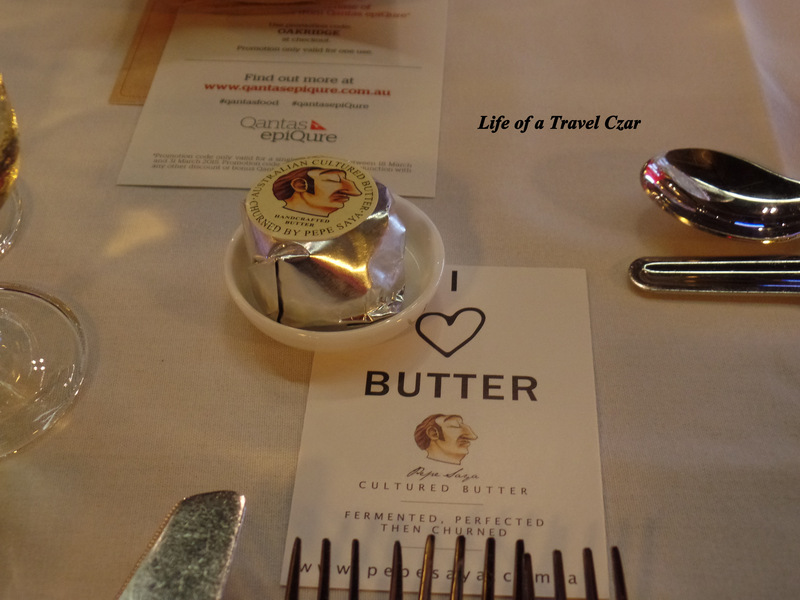 They provided us with a little card which outlined the process they use to make their butter (it reads milk from happy cows, filtered water and a dash of home grown Aussie salt) – which sounds good to me! They first sold their product Rockpool and prior to that no one wanted Pepe Saya butter preferring the larger international products. It is so refreshing that an enterprising local company was provided a lovely step-up. Lemon curd sandwich with raspberries and Pepe Saya mascarpone. In terms of the dessert, there is the tartness of lemon curd mixed with the fresh fruity raspberries which are a pure delight. The sandwich has this beautiful soft fluffy texture while the rich pure creaminess of the Pepe Saya mascarpone balances the tartness of the lemon curd and the intense fruit flavours of raspberry to produce a balanced taste sensation to round out the night. As with any dessert wine the high concentration of sugar hits you while you begin to absorb the notes of ginger lily, the hints of honey ‎and the stone fruit characters. The sweetness is balanced with a streak of acidity and light notes of tart citrus peel to provide a unique dynamic in the finish. 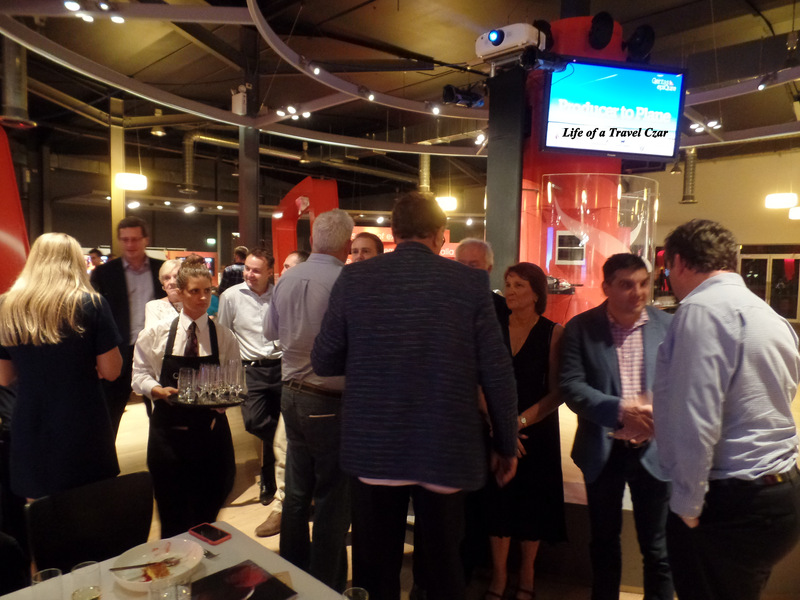 A truly enjoyable night with fine food, lovely wines, friendly service and a unique insight into the produce which underpins the dishes we enjoy onboard. It will definitely make the next flight that much more enjoyable. 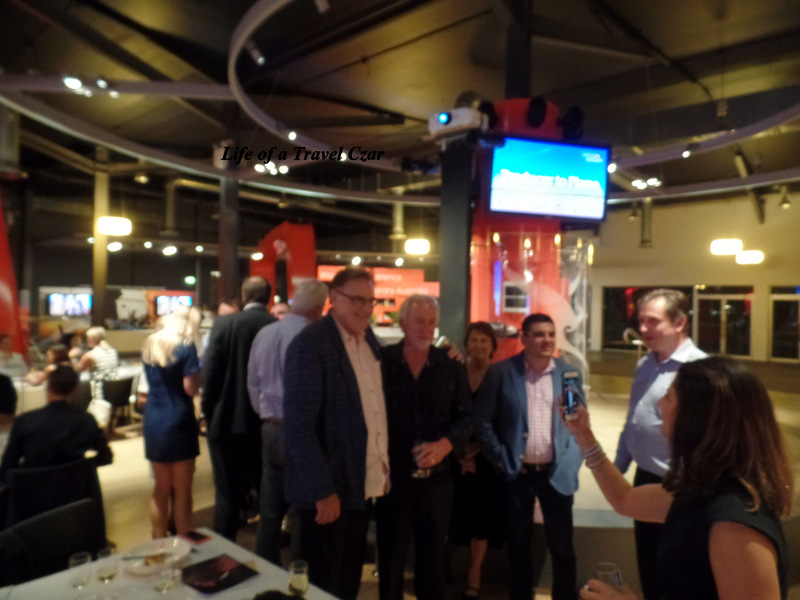 The friendly Qantas EpiQure staff that sat at my table were also such good hosts for the evening. The photo below is of all the producers who helped put on a fantastic night. It is just hard not to admire the effort of the producers who focus on such fine details such as soil structure and water quality and who risk life and limb to deliver a quality product. 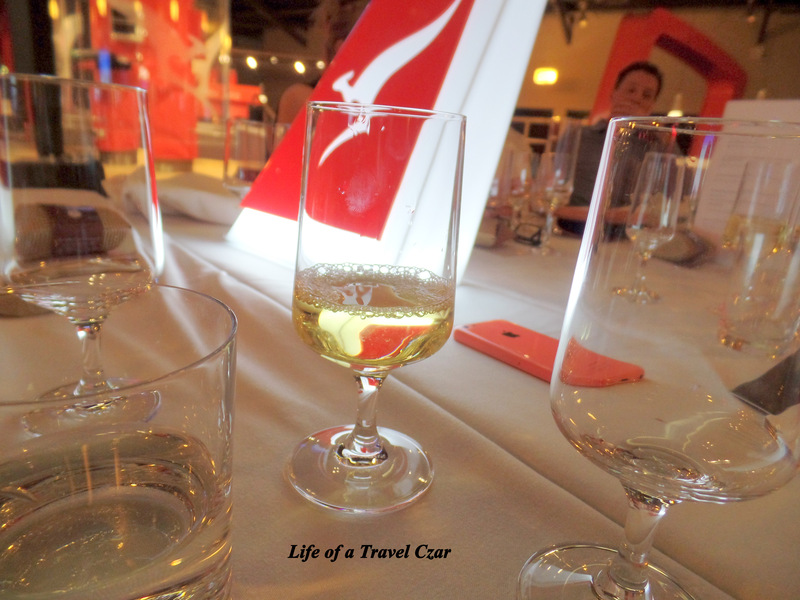 Then the hours of thought and culinary experimentation from the Rockpool chefs / consultants to design the menu and off course the friendly service of the flight attendants who serve it up. They all work together to ensure the dining experience on the plane is second to none. Qantas EpiQure (Qantas’ online food & wine community offering) hosts some amazing food and wine events such as celebrity chef dinners, new release wine tastings and experiences which are quite unique such as this event. Details of future events can be found here. What I would find most interesting about such an event is to learn about just how the airline goes about identifying the best produce & who to partner with. Did they go into any detail about that? Sorry if you feel you’ve already mentioned that, if so it hasn’t become clear to me. It was discussed at a high level – that the Rockpool consultants focused on local producers, quality produce and sustainability. In terms of the exact mechanics, like taste testing and ranking before being selected, that wasn’t discussed in detail. OK cool I see. It sounds like it was more focused on introducing specific producing partners to end consumers then.